Wrong. Company Chameleon’s new show, Pictures We Make, has nothing to do with film or television, as I conjectured at the end of my review of Gameshow. It returns instead to the company’s more familiar roots in contact improvisation and partnering. On Friday evening at Z-Arts in Manchester, Kevin Turner and Anthony Missen took their new work out for a run and they were not alone. For those familiar with Turner and Missen as a duo, this is a new departure for they rarely if ever dance together here; they are too busy discovering the joys of interacting with Gemma Nixon and Elena Thomas who make up the quartet of characters. Pictures We Make explores the question of relationships, of ‘how we navigate the space between our experience and expectations’ as we plunge from I to We. ‘Our insecurities and perceptions about how things should be are tested and reflected back by those with whom we share relationships.’ It is a sometimes explosive but always passionate involvement between the four of them that has all the familiar physicality of Turner and Missen but with an equally powerful female element that gives as much as it gets. Pictures We Make will be one of two works on a double bill that will have its première on February 14 (an appropriate date for a theme of relationships) at The Lowry. The second work, to be created by Jonathan Goddard and Gemma Nixon, will go into rehearsal next week. This evening’s showing was in front of invited guests and friends to garner feedback as much as to put in a good run before the creation of the second work begins. The ‘pictures’ of the title refer to snapshots of relationships lived and remembered, of emotions exposed and hung out to dry, of joys as well as sorrows. Because there are only four characters and their proclivities are heterosexual, it is all too easy to interpret the heady display of relationships as a lot of feral swapping between the two couples, but there are no bust-ups or recriminations between the two men or the two women, which suggests the memories do not exist on a collective level but within the experience of each individual over a long period of time. Who ends up with whom is immaterial, as the narrative doesn’t run in that kind of linear progression: it is only the framing of the ‘pictures’ that closes the circle and gives the proximity of relationships an almost incestuous flow. What the various duets allow is the exploration of a rich seam of emotional involvement, and each dancer gives of him or herself in a risk-taking, primal way one audience member later characterized as relentless (the pictures we make are not always pretty, and if the pictures in this work were photographs, some of them would have been ripped up or burned). There are solos as well as duets: the solos – I am thinking particularly of Thomas’s – reveal the inner turmoil in the context of the particular relationship. Towards the end, Thomas is like a filly that is learning to get up, angular, awkward, unable to support her weight at first, but determined to place those legs under her. Of all the characters, she shows a certain emotional fragility — a victim almost — though she matches the other three in the abandon with which she approaches her relationships. Nixon sets the emotional tone with her opening solo, and seems to be in her element throughout the work, lyrical and tough with a formidable gaze when roused. The two men, divided in their attentions, nevertheless form a powerful unity. The only props are chairs, a whole pile of them in the exposed wings and some on stage which become islands occupied by the recovering or simmering characters. Nixon is adept at hurling the chairs across the stage in moments of acute frustration or hurt. The starkness of the metal-framed wooden chairs is in marked contrast to the emotional maelstrom that engulfs the relationships, like the setting of an annual dance between the boys’ school and the girls’ school down the road. Miguel Marin created the score as so many stories sewn together, finding a sound for each character and adjusting those sounds according to the situation in which they find themselves. It works beautifully with the choreography and its theme. Looking back, the use of chairs and the circular nature of the relationships suggest a vestige of musical chairs, a game in which only one person is left standing. The transition from ‘I’ to ‘We’ inevitably comes down to ‘I’ after all. Martha Pasakopoulou stomps around the stage in a yellow dress proclaiming in a language I don’t understand, fist clenched in the air as if she is leading a demonstration of one. She has a clear, strident voice that is not afraid to climb into the higher registers, and there is something of the gamine in her unselfconsciously ebullient performance; she is evidently unaware anyone is watching. When she finishes her song there is a ringing silence in the theatre, and then laughter as she walks to the back, and steps carefully into the corner like a gymnast ready to begin a diagonal routine. With these two opening sequences, juxtaposed with disarming innocence, Pasakopoulou has captured our full attention; like an ingenuous child she can now lead us wherever she wants. This is Eva Recacha’s The Wishing Well, in which ‘a woman creates her own particular ritual to obtain her wish in order to get a direct line with the gods.’ It is full of observations and insights into the nature of hope and faith on the one hand, and of the superstitions and tricks we use to subvert them on the other. Recacha acts as storyteller and observer, commenting on the (at times) recalcitrant, (always) whimsical Pasakopoulou in her devout double-dealing, and demonstrating, in the poignant, final moments, the futility of her self-deception. Pasakopoulou’s character is called Martha, who begins by making three wishes, in lyrical, animated mime. It doesn’t matter what they are but rather what strategies she uses to achieve them, and the beauty of the work is in the imaginative mime Recacha devises for all these strategies that she incorporates into a body language Pasakopoulou so hearteningly delivers. The stage is lit by Gareth Green like a game board, edged with a white band of light that forms the limit of Martha’s world; she never steps out of it. Martha has spent so much of her life in an unwinnable competition with God that she arrives at old age without ever having achieved her wishes. As an old crone, legs bent, she shuffles off to the corner of her world, as if to cross the road; only then does the white band recede, and after some hesitation Martha crosses; the band of light closes behind her. The Wishing Well has been chosen for The Place Prize Final. Robbie Synge’s Settlement is a piece for two performers and three sheets of chipboard, with a score by James Alaska. At the beginning the three sheets are centre stage, leaning tentatively against each other, lit by Brian Gorman as an architectural form. Settlement develops as a game between Erik Nevin and Robin Dingemans in which one creates an equilibrium of sheets, and the other knocks it down; one proposes, the other disposes. Settlement can apply both to the built elements of a community and to an agreement between two entities in a dispute. Synge’s work covers both meanings in a seamless structure, as he explores the effect of the everyday built environment on our physical and mental states. It would be easy to see the rivalry between Nevin and Dingemans as a personal narrative, but if one understands the chipboard sheets to be a metaphor for the built environment, then both characters are reacting to it in their respective ways, which in turn affects them individually, like neighbours arguing over a fence or, on a much larger scale, townspeople suffering from an ill-thought planning scheme: one person’s order is another person’s chaos. There are also elements of cooperation: Nevin and Dingemans stand side by side, each holding a sheet upright on the ground. They let go of their respective sheets and change places. Moving the sheets further and further apart they repeat the game, with surprising and unpredictable results. Later, the sheets become islands and the two performers help each other move from one to the other. In the end, Synge reflects on the sense of loss: one might rejoice in the destruction of a house, for example, while the other may be lost without it. After Nevin kicks down a final chipboard structure, Dingemans leans against the back wall as if wounded. The title of Goddard Nixon’s Third, is taken from a line in the T.S. Eliot poem The Waste Land: “Who is the third who walks always beside you?” Eliot apparently included this line after hearing of a mysterious encounter experienced by the explorer Ernest Shackleton and his men on his famous 1916 expedition. It is now known as ‘the third man factor’, a psychological phenomenon also linked to guardian angels or divine intervention. Michael Hulls’ extraordinary lighting and set design place the context of Third quite literally, on a blue-white, ice-bound floe that Lawren Harris might have painted. He even brings on a snowstorm at the end that envelops the dancers and the space around them. But the weather conditions Hulls so brilliantly evokes are inimical to the nature of the duet, to the loose-fitting, urban, hooded costumes (by Alice Walking) and to the often floor-bound choreography. Jonathan Goddard and Gemma Nixon are not dressed for this level of cold, their duet does not belong in the Antarctic – even if the subject matter derives from an expedition there – where lying on an icy floe would be unthinkable. Hulls has taken his inspiration and run with it, but he has outrun the duet on which it is focused. The duet itself is intimate and warm, the flow of movement soft and pulsing; Goddard and Nixon are two dancers who move with extraordinary agility, speed and precision but who also possess a lyrical quality that appears effortless; their performance is anything but cold, and in this context, the pulling on and off the hoods becomes an unnecessary distraction. However, their artistry is just a pleasure to watch, radiating enough heat to melt even the most inhospitable conditions. The evening ends on a warmer note with a smile of a work from Seke Chimutengwende, The Time Travel Piece. This one is too tongue-in-cheek to make it to the finals, but sends us home feeling that much better for having felt its infectious irreverence. The stage is lined with banners that are reminiscent of the recent Olympics, and Chimutengwende is our amiable dance commentator. He has been fortunate enough to travel forwards in time to see dance performances at three different but not consecutive periods, 2085, 2501 and 2042. He is thus in a position to comment on, and illustrate, the styles of dance in those respective eras for our benefit. 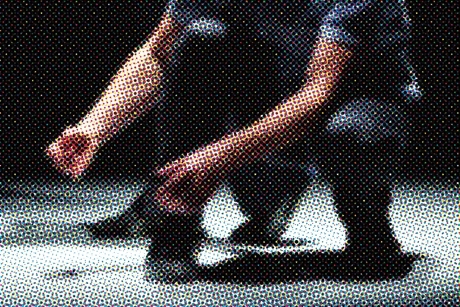 He has a troupe of the ‘best available’ contemporary dancers on whom he has restaged the dances from memory; it proved impossible for him to record what he saw as our technology doesn’t work in the future. Due to the huge financial costs of his government-sponsored time travel, he could only spend an hour at each performance. By 2085, scientists are probing smaller and smaller objects – far smaller than atoms – and choreographers are similarly interested in smaller and smaller movements. Fortunately the audience’s powers of perception have increased dramatically. Chimutengwende introduces a trumpeter and five dancers who start performing. If nothing seems to be happening, it is all to do with our reduced powers of perception, though it is clear that the dancers have a remarkable control of their movement vocabulary and one can see in the choreography an evocative blend of influences from the early part of this century. The score is rich in tonality, and beautifully played on the trumpet by its composer, Michael Picknett. By 2501, everyone has access to time travel; it’s as easy as texting today, which makes the idea of a rehearsal period obsolete; you can rehearse one day and return to it the following day, which means that choreographers can spend unlimited time on making work. Another trend, and one that was realized in the performance Chimutengwende saw, is the development by each dancer (over an unlimited period of rehearsal) of a movement sequence that perfectly expresses their essential nature, which is then the only movement they need to perform. This is what Chimutengwende presents, though due to limited rehearsal time the essential nature of each dancer is only approximate. The same goes for the trumpet accompaniment by the time-traveling Picknett. 2042 is an extrapolation of only thirty years from our current situation, when the pace of life has accelerated to such an extent that there is barely any time to make work, and what work is made is made very quickly because the dancers and choreographers need to move on to the next thing. At the performance Chimutengwende attended, the choreographer was teaching the performance on stage, as he had no time to rehearse. This is clearly a cause for concern, as the performance demonstrated.